At the beginning of the Iraq War in 2003, Jonathan Wilson-Hartgrove traveled to Baghdad with a group of Christian peacemakers. Upon waking one morning, the group learned a nearby hotel had been bombed by the United States. Without notifying the watchful guides assigned to them by Saddam Hussein’s government, the group walked down the street to talk with people outside the decimated building. The police soon arrived and arrested the peacemakers for being citizens of the country bombing them. They were told to leave Iraq. The people who were supposed to be their enemies saved their lives. In retelling that story back in the United States, Wilson-Hartgrove realized the people of Rutba represented the Good Samaritan of Jesus’ parable. 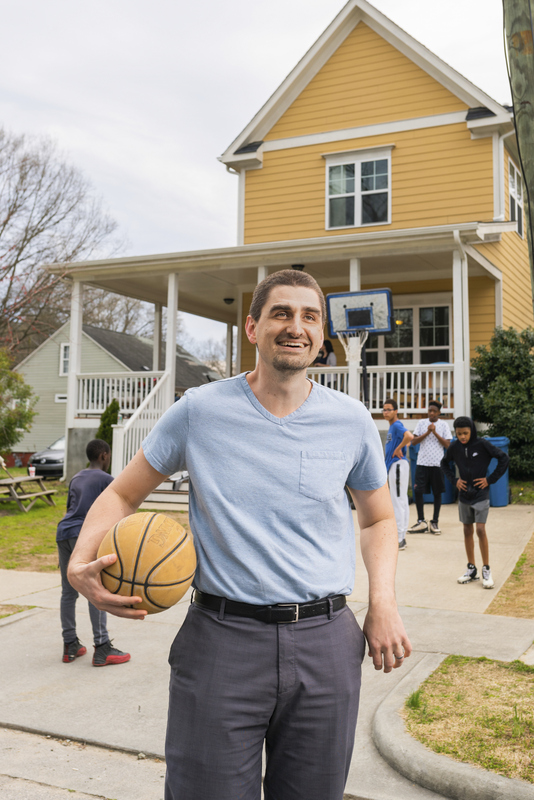 It was Jesus’ “go and do likewise” that led Wilson-Hartgrove and his wife Leah to found the Rutba House later that same year in the historically black neighborhood of Walltown in Durham, North Carolina. 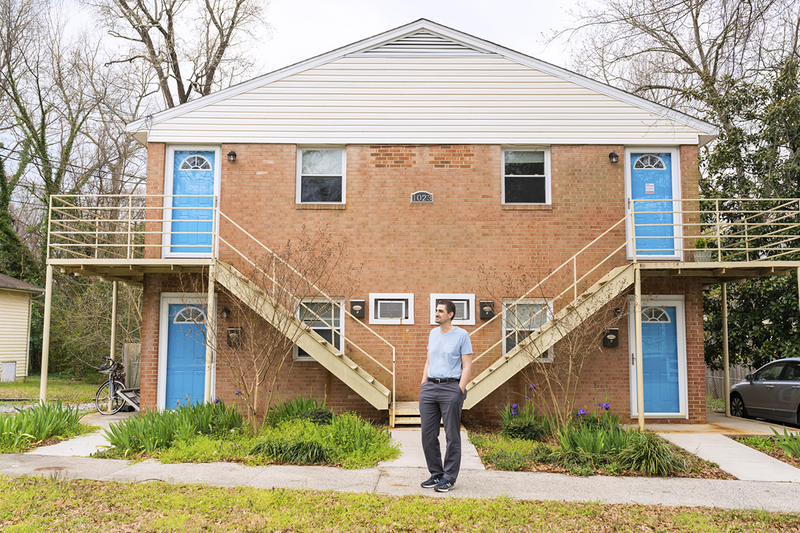 The Rutba House was founded from a desire to build the Beloved Community. This term, coined by Howard Thurman and popularized by Dr. Martin Luther King, speaks to a society based on justice, equality, and love of one’s neighbor. 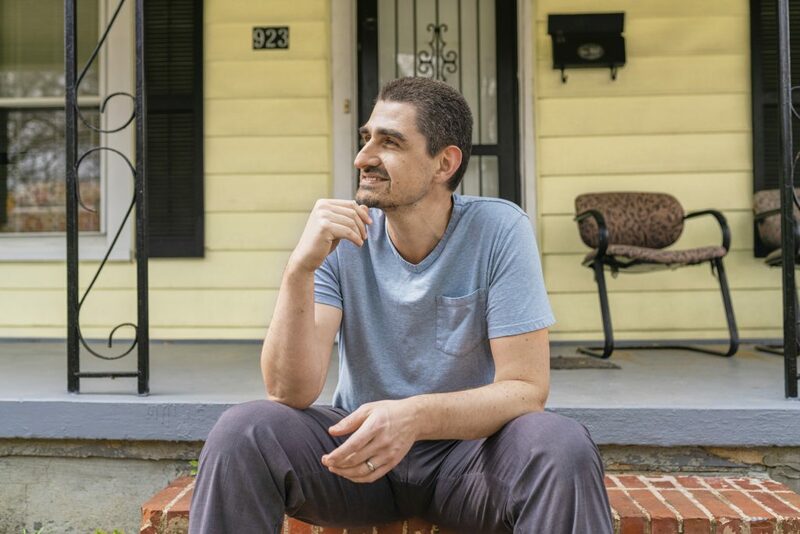 Today Wilson-Hartgrove and his family and friends reimagine this concept through a house of hospitality where the formerly homeless share community with the formerly housed. 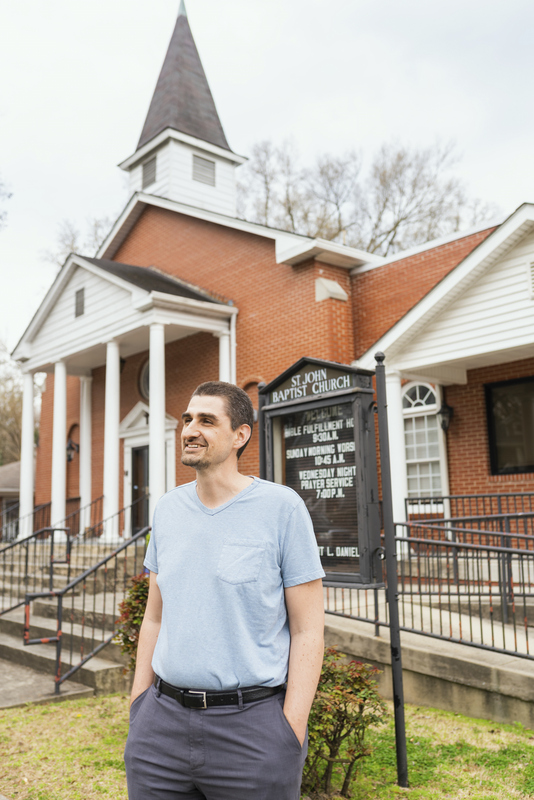 Wilson-Hartgrove also directs the School for Conversion, a popular education center that works to make “surprising friendships possible,” and serves as an associate minister at the historically black St. John’s Missionary Baptist Church. His most recent book is Reconstructing the Gospel: Finding Freedom from Slaveholder Religion. How did the Rutba House begin? Literally around the corner, she introduced us to Ronnie. His stuff was already packed up. The sheriff had locked the door. We took his stuff off the porch, put it in the car, and drove him over to the house. That’s how we got started. He was the first one to join us. It’s been 16 years now and we’ve lived with about 100 people over the years, which has been an invitation into a whole new way of seeing the world. In a lot of ways, I understand Beloved Community through their eyes. What does it mean to be family with people from this community who don’t have a place to stay? People who become homeless because they got so in debt getting treated at the hospital that when they finally got out they didn’t have anywhere to stay? 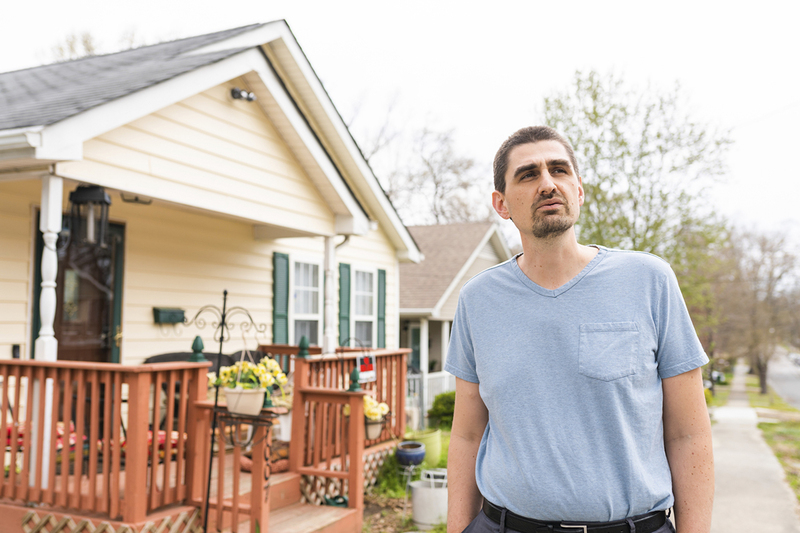 People who’ve been in prison for 10, 15, 20 years, and come home, and what do you do? You can’t get a job. That’s been our extended family here. Do you see Beloved Community as another name for the kingdom of God? Are they synonymous? I don’t think I’ve ever read a passage [of Scripture] where you couldn’t say in place of the kingdom of God, “the Beloved Community is like this.” That’s the subversive linguistic thing Jesus is doing with “kingdom of God.” He’s offering people who knew the king was selling them out as a puppet performing for the empire another kingdom. Maybe we should have a version of the New Testament that says “Beloved Community.” I try to preach that way. How do the Rutba House and the School for Conversion embody the ideals of the Beloved Community? Embodiment and the Beloved Community for me have come together in learning from a tradition of people who knew—because the imagination of white supremacy was turned against them—they knew in their bodies that they had to have an alternative, there had to be something else. Those people have been my teachers and in many ways, the teaching and writing I do is to say that people who have been malformed by whiteness can learn from this rich community that I’ve found here. Which is completely open to, and has always been completely open to, people with light skin. It’s not that it was ever exclusive. It’s that whiteness itself was a lie that kept people from it. And still does. Why is it important to move closer to people who are different from us? What does Jesus have to say about that? This is where we find the kind of joy and gladness that God offers, in being part of how God builds something new, particularly with and among people who’ve been rejected. Howard Thurman writes about this in Jesus and the Disinherited. This is where the Gospel makes sense. You come alongside the people that Jesus came alongside, the people who were disenfranchised, rejected, who lived with their backs against the wall, and the things Jesus taught and the things Jesus did begin to make sense. Sometimes we talk about diversity or multiculturalism as if everybody’s unique and we need to share that with each other, which is fine, but I don’t think that’s quite what the Bible is talking about. I think Beloved Community is actually the community that is possible among people who’ve been rejected. Because systems of rejection are always about elevating a few and distancing others from them, if you begin Beloved Community among those people who’ve been rejected then it really is a place where everyone is welcome. We could all eat. We could all have homes. We have enough, but we don’t have enough for everybody to live the way we dream of living in this country. How has living in community with and being led by people of different backgrounds and upbringings transformed you? It taught me that the main problem with whiteness is that it cuts off the capacity to see a lot of what’s happening. For me personally, it was a long journey realizing there were a lot of things I didn’t see by meeting people who were just like me in all kinds of ways except that they had an entirely different life because growing up, everyone saw them as poor, black, and unintelligent. Whereas I had grown up in rural white culture but was encouraged and affirmed. Once you begin to see the systems we live and function within through other people’s eyes you can begin to think critically. You think about how they’ve been affected, but you also begin to think critically about what that has done to you. It is a profound impact that’s hard to sum up. 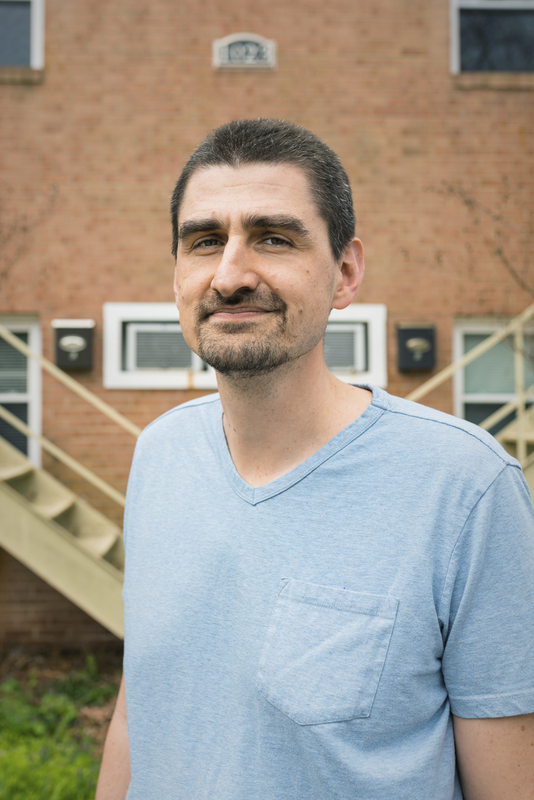 The experiences of all the people we’ve lived with over the years [in the Rutba House] helped me begin to feel in my body the way the system works, in a way that I don’t think you can get just by studying sociology or public policy. It impacts the people you love. And the people you love are also the people who annoy you, [because] it’s intimate—in all the complexity of what intimacy is. You use the word reconstruction when speaking about how we need to reimagine the Gospel in order to confront systemic racism in America. What are the differences and similarities between reconstructing the Gospel and reimagining the Gospel? I love the imagination piece. I love the way the prophetic poetry of the Bible is all about imagining a world other than what’s right in front of us, other than what we experience every day. I use the language of reconstruction because it has helped me imagine that not only is the world that is not the one God made it to be—and not the only one that’s possible—but we’ve also inherited a history of other possibilities. Not only is this not the way it has to be, but it’s also been other ways in the past and we’ve inherited that too. There’s a historical realism to hope that I’m reaching for when I talk about reconstruction—to say that in the history of this place there have been times when black and white people worked together to imagine what multicultural democracy could look like. Here in North Carolina, we live under the Constitution of 1868, which was primarily rewritten by an AME Zion African-American preacher and a white Congregationalist preacher. When you read it with that in mind, you realize they were carefully reconstructing. For instance, they say there are inalienable rights and among them are life, liberty, “the just fruit of one’s own labor,” and the pursuit of happiness. That’s a re-imagination. The tradition of an often very faith-rooted vision of how things could be different has been called reconstruction in our history. For Christians, that also includes how we understand who Jesus is and what this faith is that we’re living in. Because our faith was distorted to accommodate itself to white supremacy, and still is, in many ways, if we don’t intentionally reconstruct, if we don’t look at how that happened and what we have to change to rediscover what Jesus was really talking about, then I think it’s fair to say what Frederick Douglass said: There’s a Christianity of the slaveholder and there’s a Christianity of Christ—and the two are very different things. What are some practical steps we can take to unlearn habits of social division and build the Beloved Community? I think it begins with saying yes to the invitation that is always there. There’s always an invitation to be a part of building the Beloved Community where you are. Find who’s doing that. Show up in those spaces and ask, “How can I be part of this?” Commit to doing the work, the work of healing in our bodies that white folks and privileged folks need to do. That’s where the journey begins. If your body doesn’t have the capacity to follow the leadership of someone who’s black or brown then it’s really hard to be Christian. Jesus is black and if you can’t follow a black leader you can’t follow Jesus. That’s the thing Christians have to grapple with. It’s a spiritual issue we carry in our bodies. How should people in positions of privilege build community with people who have traditionally been marginalized, without harming communities who have been planted in their neighborhoods for generations? The first thing we’ve had to learn is we have to recognize the ways we participate in gentrification. Then, more than anything, hear the voices of those crying out in pain because they’re losing something. We have to hear that voice and really understand what’s being lost. It’s a greater good being lost. People here who are concerned about gentrification are not concerned about losing their house. It’s not like, “I’ve got this really sweet spot and I want to keep it.” That’s not it. You have to listen long and realize what people are losing is community. This is a neighborhood where families have rented for five and six generations. It was never about the particular structure they were living in. There are families tied together in this place and that’s what’s being lost. The community is losing the capacity to be in one place together. We have to draw close enough to hear what’s actually being said and then be part of the community that’s going to navigate that together. We’re not going to fix it but we can show up and be part of all those conversations about how we survive it together. That’s what being part of the community is. You write in Reconstructing the Gospel that reconstruction is first and foremost about knowing which Jesus we follow. For you, which spiritual practices are the most essential for clarifying which Jesus you follow? Reading scripture and praying in community is clarifying. There’s a whole contemplative tradition in the black church that goes back to the ring shouts, the call and response, and everything that was brought from Africa but also remixed and reimagined in the conditions of enslavement. The practice of being in spaces where the scriptures are read and proclaimed, where we pray and have contemplative practices rooted in a tradition of worshipping the Jesus who sets the captives free—that’s the most important spiritual practice for me. 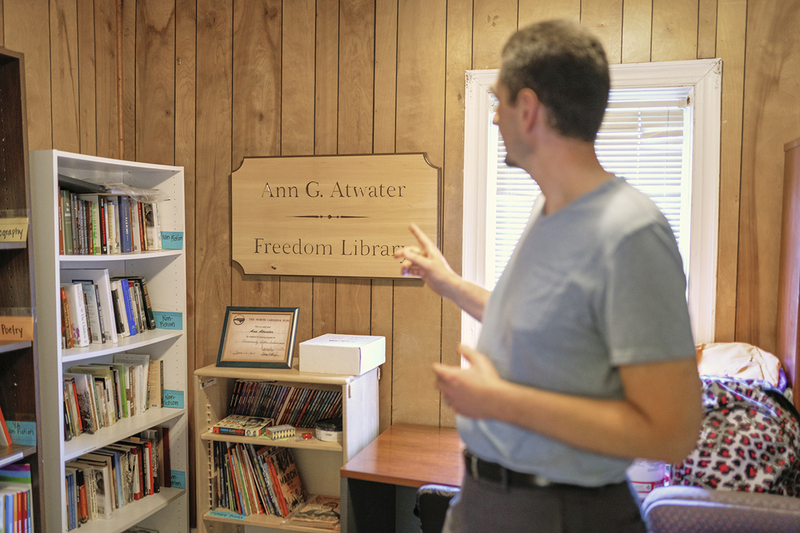 We spoke with Wilson-Hartgrove in the School for Conversion’s Ann Atwater Library. The library is named after “Grandma Ann,” a beloved community leader, civil rights activist, and Wilson-Hartgrove’s spiritual mother. A movie based on Ann’s life and her friendship with KKK leader C.P. Ellis, “The Best of Enemies,” is out April 5, 2019. Churches and small groups interested in discussing the movie and its themes can download this study guide written by Wilson-Hartgrove. Photography by Owen S. Jordan. Lindsy writes from Miami where she, her husband, and their five kids endeavor to love their neighbors as they love themselves. She is passionate about downward mobility, ushering in a more livable planet, and good tattoos. 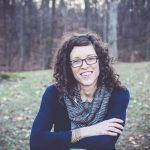 She is a co-host of Upside Down Podcast where she enjoys unscripted conversations on faith and culture. Follow her on Instagram @lightbreaksforth, on her website lightbreaksforth.com, and on her podcast upsidedownpodcast.com.